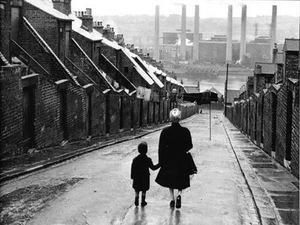 ‘The end of welfare?’ is the headline on the current issue of Prospect magazine, illustrated with a celebrated Bert Hardy photograph from the 1950’s – which is appropriate, as the first occurrence of that headline probably dates from the same period. The main story is by Peter Kellner, and is a lot more nuanced. His main argument is that coalition welfare reform is strongly in tune with public opinion. But however much the public may dislike social security spending in the aggregate, fitting that general attitude to concrete proposals for reform that will yield major savings while still reflecting the detail of public opinion is a different matter. This, to me, is one of the clearer lessons from Yougov’s detailed polling questions. Thus, while the coalition aims to cut Disability Living Allowance expenditure and caseload by 20 per cent, the poll shows the majority want expenditure to stay where it is or increase – even if that means higher taxes – while only 11 per cent favour cuts. This is one of the major new findings of this poll, and why Prospect didn’t make more of this glaring mismatch between the coalition’s welfare reform bill and public opinion baffles me. The poll also showed minorities, ranging from 9 per cent to 23 per cent, in favour of cutting pensioners’ benefits, benefits to the low paid and child benefit for families paying standard rate income tax. Strong support for cuts was confined to only two of the six types of benefit (or rather of recipient) that Yougov asked about: unemployed people and unmarried single parents, where 42 per cent and 44 per cent favoured cuts. So the focus of the demand for cuts is not ‘welfare’ as a whole, but out-of-work benefits to non-disabled people. How much does the UK spend on these benefits, and how much has expenditure increased over time? Kellner cites growth in overall social security expenditure from 5 per cent of GDP in the early 1950’s to 14 per cent today, but this is of little relevance until we know how much of this growth has gone to unpopular as opposed to popular spending. Answering this question means sorting through the data on social security expenditure and extracting information on the benefits people seem to dislike most – or that go to the people they dislike most – while excluding spending on items (or people) they do like. The chart below shows expenditure on the main out-of-work income replacement benefits for working age people: unemployment, invalidity and social assistance benefits and tax credits to out of work families. As of 2009/10, the UK was spending 2.37 per cent of GDP on these benefits. This was almost exactly what the UK was spending thirty years earlier in 1979/80, and a lot less than in most years since then. Bear in mind that this was after the biggest collapse in GDP since the great depression. Comparisons with years before 1978/9 are less robust because we can’t exclude some payments to pensioners from the data prior to 1978/9 (although this really does not seem to make a huge difference to the trends). With that caveat in mind, we can say that expenditure on these benefits as a share of GDP prior to the recession probably wasn’t very different to the early 1970’s. The popular notion that the UK has been spending record amounts on these benefits in recent years is the opposite of the truth. I expect these figures to be greeted with disbelief: three broad points might help with any confusion. The first is a reminder that expenditure is expressed as a share of GDP: obviously if expressed in cash terms, with or without adjustment for inflation, the trends would be different. 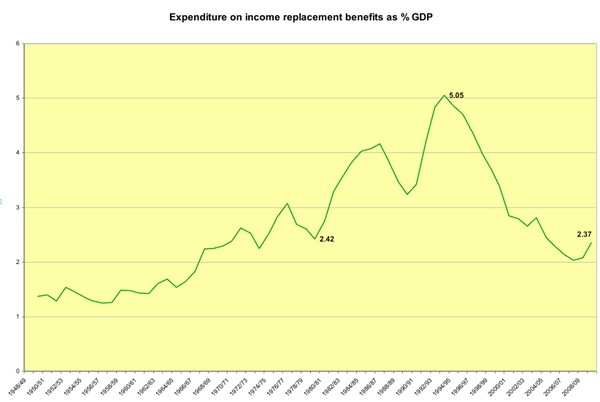 Secondly, as the chart shows, expenditure on these benefits did increase dramatically at various points during the late 1970s, 1980s and early 1990s, and these successive rises were usually only partly reversed during periods of prosperity until the turn of the new century, so the reversion to 1970s levels of spending is a very recent phenomenon . The third is that housing benefit, one of the few major sources of growth in out-of-work benefit expenditure, is not included in the chart, which is confined to income replacement benefits intended to cover other basic living expenses. Why has expenditure fallen so much? Partly it’s because there are a lot fewer people on out-of-work benefits than there were in the mid-1990s (by about 1.2 million). But that can’t be the whole story because while there may be lower reliance on out-of-work benefits now than in 1995, that doesn’t hold if we compare with the 1970s and 1960s. The key to the puzzle lies in the declining value of these benefits over time, largely due to the fact that from the 1980s they were uprated with prices rather than with earnings or GDP growth. So these benefits, contrary to what seems to be widely believed, have been falling ever further away from average living standards over time. Alternatively, and this is just the same thing phrased differently, the U.K. got a lot richer and was better able to afford these benefits. The problem with simplistic calls to cut ‘welfare’ therefore is that the elements that people don’t like represent ony a fraction of expenditure, and one that was in long-term decline until the recession. 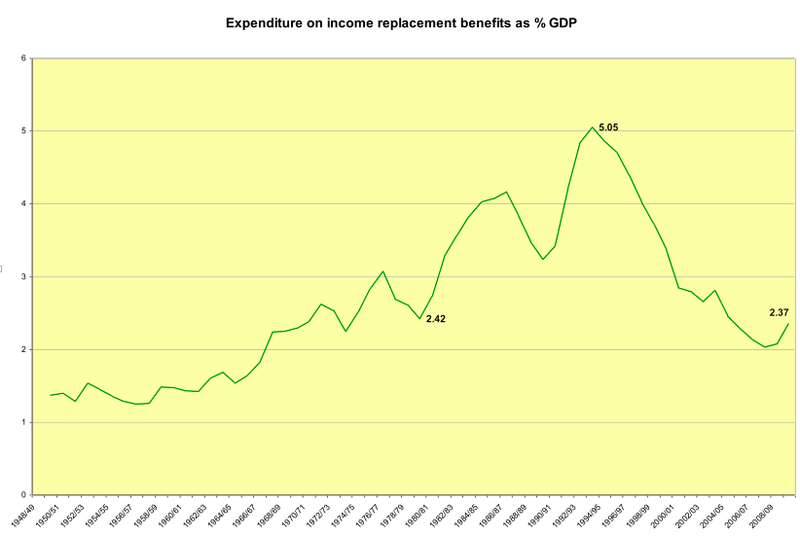 In fact, the benefits included in the chart account for only 16 per cent of all ‘welfare’ expenditure. This is what our political classes are in denial about: on all sides, politicians and commentators are desperate to maintain the illusion that there are big savings to be made by cutting payments to claimants who are unpopular with the public when the great bulk of spending is going where the public seems to want it to go. And that simple, inconvenient truth explains why the burden of coalition welfare reforms is falling so heavily on the disabled and on people in work as well as on the out-of-work claimants for whom the public, the politicians and most of the commentators show so little sympathy. Benefits included in this analysis: Social assistance benefits: national assistance, supplementary benefit (excluding pensioners from 1978/9), income support for those below pension age (including Income Support for unemployed from 1991/2-1996/7), one parent benefit. Invalidity benefits: Industrial injuries benefit, sickness benefit, invalidity benefit, statutory sick pay, severe disablement allowance, incapacity benefit, employment support allowance. Unemployment benefit includes jobseeker’s allowance from 1996/7. Tax credits include family credit and child tax credit to non-working households. Data is from DWP benefit expenditure tables and HMRC tax credit take-up estimates. GDP is from ONS, GDP at current basic prices (ABML series). Good on you for coming up with some numbers. Refreshing difference. 57% of people who are assessed fail their assessment. What percentage of people didn’t turn up for their assessment? That’s a strong indicator of the numbers who won’t get through at all. It’s still doesn’t explain why the numbers have gone from 1 million to 2.5 million. There has not been an increase in disability of 250%. It’s fraud, and its fraud by the government. ie. If I ask you for a million and you give it to me, who is the idiot? Me for asking or you for giving it to me. If you give me other people’s money, then its fraud. So care to redo you numbers with the total number of people invited for assessment. That’s the population you need to consider when coming up numbers. By excluding the no shows, you’ve inflated your figures. That’d be 35% of the total, obviously. That doesn’t mean there are 40% of people who shouldn’t be claiming – just that around 40% of a given group of claimants of ESA will probably be coming off the benefit in a given year. That makes sense – it’s meant to be a short-medium term benefit. The number of people on benefits was lower twenty years ago in part because it was TWENTY YEARS AGO. 1. We’d just come out of recession. 3. Our population demography shows us a population which is 7 years older than it was 20 years ago (if that makes sense) – which would be an indicator of greater dependence on sickness benefits. According to the Disabled Living Foundation – there are 2.1 million disabled people of working age living in the UK – which gives us a benchmark figure. There’s a number of sick and disabled people we’ve got in the UK at any one time, which is those two numbers added together – and it’s been a pretty stable number for over a decade. I think it’s about 2.5 million. Ok – misinterpreted your post. Turkeys and Christmas spring to mind. They will always quote the top end. So given the number of disabled hit 2.5 million, what were the 400,000? Why has there been an increase from 1 million to 2.1 “entitled”? What has caused the increase in disability? All the research I’ve seen on the matter points at “Hidden unemployment”. ie. Moving people off the unemployment figure to benefits, because its embarrassing. Mostly young migrants. However, lets say its an equal spread. 8.7% increase. 87,000 people. Still leaves 1,413,000 to explain. So, 2.5 million times 35% drop out rate. Most I suspect are those who aren’t entitled. 875,000 people who have been claiming who shouldn’t have received money. Since its being going on since Thatcher, that’s a massive black hole. It’s compounded up. Our population demography shows us a population which is 7 years older than it was 20 years ago (if that makes sense) – which would be an indicator of greater dependence on sickness benefits. The length of time people are in old age homes, as a percentage hasn’t gone up 250%. With the removal of dangerous industries, and that those who were disabled from things like coal dust and asbestosis have sadly died off, the number should have been dramatically reduced. and it’s been a pretty stable number for over a decade. I think it’s about 2.5 million. It’s still up from the 1 million from the time before the Tories move the unemployed ‘off the books’. I keep reiterating the question because its being ignored. Why the increase from 1 to 2.5 million? The figure of 10 million is just bonkers too. What about research that points out that it is hidden unemployment? ie. Not undertaken by me? 1 million to 2.5 million claimants is significant. So try researching “hidden unemployment”. It’s the jargon the researchers use. 1. Is the level of disability correlated with unemployment. Answer yes. Now for areas, say ex mining areas, there is a likely confounding variable – previous employment in a dangerous industry. However, that should decline with the time since that industry was up and running. It hasn’t. Now, does that explain areas like Liverpool? Nope. High unemployment and high disability go hand in hand. The real level of unemployment in the East Midlands in January 2002 was nearly three times higher than the claimant count – 188,000, compared to 65,000. The stock of hidden unemployed in the region is divided fairly evenly between men and women. Unemployed people who have been diverted onto sickness benefits (mainly Incapacity Benefit) make up the largest group of hidden unemployed – an estimated 75,000. These are men and women with health problems who could have been expected to be in work in a fully-employed economy. That’s the crucial point. A large number of people diverted for political reasons. Both left and right. Page 11 onwards goes into lots of detail. Worse than the figures I quoted. The 1.2 million you’re quoting is the number of people on ‘out of work benefits’; not just disabled people. So it doesn’t really matter if they’re reclassifying people as ‘disabled’ who you believe should be ‘unemployed’; it’s the same number – the DWP calls them all ‘out of work benefits’ nowadays. The 2.5million (ish) is the number who are long-term out-of-work (which is ‘more than two years’ in DWP terms); the majority aren’t out of work for 5+ years – which matches the ‘ESA is meant to be temporary support’ idea. At any one time in the UK there are around 5million people who are actually claiming out of work benefits – it’s just that the overwhelming majority are back in work within 3-6 months are thus are very quickly ‘off the books’. Obviously this takes a bit longer during a recession (because fewer full time jobs are being created), and the number of jobseekers builds up. The number injured in workplace accidents has been reduced (they’re now the smallest single group of disabled claimants). The biggest single group who claim disability benefits are mentally ill – which reflects our current work environment (and probably our low priority on mental health care, too). The number of people who are classified mentally ill or at risk of mental/ behavioural illness has actually gone down since the 90s; our approach to people has changed. i.e. we support them in the community with benefits, rather expecting their families to provide all the support – or just putting them in care homes and prisons.